"It's Always Something...": Hello Cupcake! 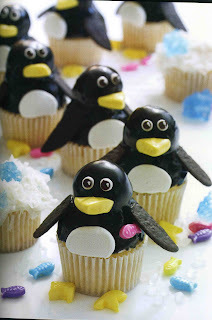 My “Hello Cupcake!” book featured a recipe and directions for making the cutest “March of the Penguins” cupcakes. From the picture, it wouldn’t require Julia Child to whip these puppies up. They’re cupcakes for pete's sake - What could be so difficult? My plan was to take them over to K&B's that afternoon as their nephews were visiting from Colorado and I thought they might like a cupcake or two. The penguin recipe included white frosting, chocolate frosting and black food coloring. That is when I really should have applied the brakes. Finding black food color was a challenge but I was committed to this little project and eventually tracked some down. A word of warning: Black food coloring is pervasive and disgusting. It gets on and into everything. After using it, my fingernails were dyed black/blue (not so appealing when you are in health care) so I ended my cupcake-cooking day soaking my hands in bleach. Oh, by the way... if nothing else, I consider myself to be a 'trooper' and once committed to a project, I will see it through to its bitter end. This project started at 8am and ended at 3pm. Other items necessary but that were not so easy to find were, plain donut holes (for the little feller’s heads) – no luck. I compromised by using glazed donut holes. Plain mini donuts were to be used as penguin tummies but again I had to choose an alternative – powdered sugared mini donuts were used. Have you ever eaten one of those? They are repulsive - but they were my only choice and by God – I was making the penguins if it was the last thing I ever did. You would have thought that after traveling to multiple stores, all in the name of short, fat penguin cupcakes, I would have called it a day. Not this cupcake-baker. Muddling on and several hours later, I had made a royal mess of the kitchen, myself and Duke, my yellow lab mix. Who knew he would snag a freshly frosted black penguin from the kitchen table when my back was turned? Not pretty. FYI: Other penguin parts included marshmallows cut to create the white ‘apron’, "Beaks" were Starburst fruit chews. "Wings" were made of chocolate wafers/ "Eyes" were created using white frosting with mini chocolate chips. My penguins were not quite marching - maybe it was the look in their eyes, but they looked drunk. It was time for their debut. Carefully, I transported them to K&B's. Proudly, walking up their driveway with my penguins neatly arranged on a tray I promptly tripped, leaving a few of the little guys headless, on the asphalt. Kim Allen said "They look drunk because they don't have feet!" Ah-Ha! I have to tell you...this made me laugh out loud! You certainly are a trooper. I would have thrown in the towel LONG before mixing up the first of the cupcake batter. I hope your birthday was a great one! Oh! And thanks for the shout out to my blog!